Multiplayer is a real possibility, along with a version of Plague Inc. for Android. We don't know of someone having a better June 2012 than James Vaughan, who went from being a relatively unknown iOS developer to the proverbial man of the hour, thanks to his hit iPhone and iPad game, Plague Inc. Through word of mouth, the disease-building title instantly became an App Store smash hit, while at the same time permanently altering Vaughan's life. Now, faced with a constant stream of emails from thousands of fans, he spends his days figuring out new ways to evolve Plague Inc., from dreaming up multiplayer ideas to pondering a much-needed Android version. With this in mind, we caught up with James to discuss this newfound success, as well as Plague Inc.'s future. Plague Inc. has become a global phenomenon as far as new App Store games go. Were you physically and emotionally prepared for this kind of attention? 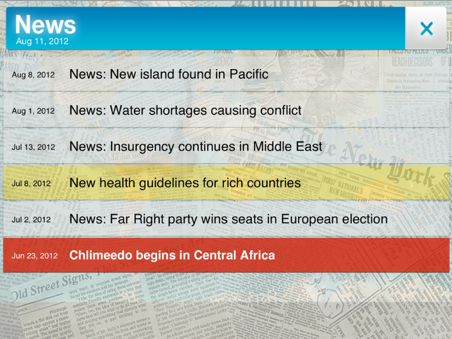 I am fantastically pleased with how Plague Inc. is doing. It all seems like a bit of a dream still. I'm sleeping OK, but for the first few weeks, I kept on waking up throughout the night to respond to feedback and check reviews. 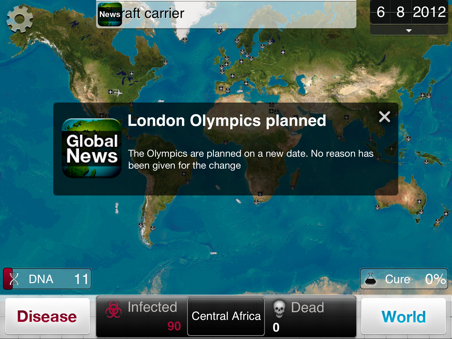 I had known for a while that Plague Inc. was an awesome game and was going to do quite well. Beta testers refused to give the iPhones back, my housemate played a version with no ending until 3:00AM on a work night, I was playing it whenever I wasn't working on it; these were all good signs. However, I was still surprised by how quickly it rose to the top of the charts and how long it is staying there. Here are some quick stats: three quarters of a million downloads, the number one paid app in the U.S. for iPhone and iPad for two weeks, a global hit with over 25,000 five-star reviews and over 7.5 million games played to date. While discussing the marketing budget, or lack thereof, you said your approach was to "make a wonderful game that people want to play". Was it really that simple? Quality mobile games get released on a weekly basis and never come close to approaching the Top Paid iPhone/iPad apps list. Why is this game different? One of the reasons why I made Plague Inc. is because I really wanted to play a great mobile strategy game, but I could not find one. I realized that there was a huge gap in the market and decided to fill it. Happily, other people also wanted a deep strategy game. You are right, quality mobile games are released all the time, but they often appear in heavily saturated genres where there are lots of similar, also great games. Their game will have a unique selling point, but in reviews, it will be "another tower defense game". 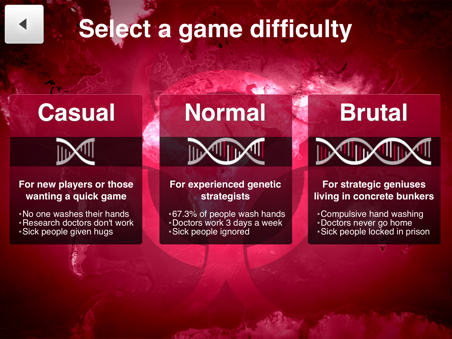 The difference with Plague Inc. is that it is operating in a severely neglected genre with very few games in there. Not only is it a high quality and entertaining game, it is also very different to most games that people have played on their mobile devices. That said, and considering the game's popularity, have you turned a profit? If you don't mind our asking, how much did it cost to create Plague Inc.? Yes, I definitely have turned a profit. I made back my costs on the first day, which was nice. I was very lucky to be able to spend under $5,000, which is extremely low for a game of this quality. My developer and I were working for free a very long time, including evenings and weekends. If that had cost money, then it would be significantly higher. You mentioned receiving hundreds of emails per day from fans. What sorts of ideas have they come up with? Favorites? All sorts of ideas, some simple and some very complicated. New disease types, changes to existing disease types, making the game easier, making the game harder, adding the ability to listen to your own music (coming in 1.3), adding more news events (1.3), ideas for more achievements (1.3), ideas for more disease combos (1.3), etc. One of my favorite suggestions to date has been historically inaccurate news items to justify the fact that some country borders are combined (e.g. Alaska is part of Canada for gameplay reasons). Also coming in update 1.3. Is multiplayer on the table? Is that even possible, given the length of single-player games of Plague Inc.? Yes, it definitely is. I have a lot of cool ideas here, which I want to work on, all of which will make brilliant multiplayer games. I just need the time to sit down and decide which one I want to progress. Currently, I am still focusing 100 percent on making Plague Inc. on iOS even better, adding functionality that players want and new plague types. When does Plague Inc. come to Android? Do you feel you'd be as successful on that platform? I'm working hard to bring it to Android as soon as possible. Will be able to share more on this soon. It takes a lot of effort to port something to Android and make sure that it runs well on lots of different devices. Still, I am confident that I can get something out very soon, and to the same high quality as Plague Inc. on iOS. Plague Inc. will be a fantastic game on Android. The concern is how to get people to pay a fair price for the game and not pirate it. People often don't realize that Ndemic Creations is just one guy, and if people don't pay for Plague Inc., then it directly hurts me. I can't continue improving it, and it also makes it harder for me to work on future games. Plague Inc. is one of the most pirated apps on iOS, currently, and this will only get worse for Android. What advice do you have for first-time iOS developers on how to get noticed on the App Store? Take a long, hard look at your game idea to check that it is in line with your ambitions. If you want something to rise to the top of the App Store, then you need to really transform your genre to stand out. There are lots of fantastic games out there, all of which compete against each other. You don't just need to make a great game, you need to make a better game. Engage with the players, respond to every email, every Tweet, every Facebook message. Not only does it make people get a better experience from your game and help the word spread, it can also give you new insight into your game. On one forum, I saw someone had come up with a fantastic 'second wave' strategy for Plague Inc. that involves letting the cure be developed and then suddenly crushing it to get a massive DNA boost. This was something I had never thought of, but it is such a cool idea. I'm even adding in an achievement for it in update 1.3.